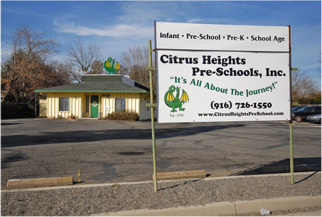 Welcome to Citrus Heights Pre-School Inc. Pre-school is the first introduction to a lifetime of learning, a journey that should start off on the right foot. Since 1970 we have been partners in providing a child-oriented environment that embraces the concept of the whole child. Our activities stimulate children's physical and intellectual development and foster social and emotional growth. Offering far more than just childcare. Our enthusiastic teachers genuinely care about your Children. They understand each child's individual developmental needs and learning styles. They take the time to help each child discover, in his or her own way, a fascinating world of play and learning. The Perfect Balance of Learning and Play!